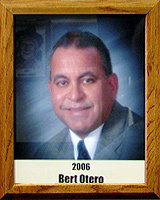 Humberto (Bert) Otero grew up in Tucson and attended Tucson High School from 1967-1971. At THS he played football, basketball and baseball. His football team was state champions in 1970-71. He played baseball at Arizona Western and then transferred to the University of Arizona where he received a degree in Education. He became a teacher at Desert View High School in the Sunnyside District and became head coach of girls’ softball in 1985, and is still its coach. He was named Tucson Citizen Softball Coach of the Year in 1986; his team was co-champions of the South Division in 1998; he was named North All-Star coach in 1999; in 2000 his team was softball state champions; in 2001 he was named Softball Coach of the Year; and in 2002 he was named Arizona High School All-Star Coach. An active member of the Arizona Air National Guard, he has served in Iraq and is currently working the United States borders. He has been active in the Tucson community, earning the Pima County Services Award (1980); the Luz Social Services Teacher of the Year Award (1999); the Operation Allied Ford ANG Chaplain Service Award (1999); and the Sunnyside USD Staff Attendance Award. Bert also has been one of the organizers and leaders for the Tu-Nidito Golf Tournament held each year since 1975 as well as being involved with American Legion, Colt and Pony baseball. In addition, he has been an official for Randolph Little League and for Desert View High School football and basketball.